The story of the community of Port William is one of the great works in American literature. This collection, the tenth volume in the series, is the perfect occasion to celebrate Berry's huge achievement. It feels as if the entire membership--all the Catletts, Burley Coulter, Elton Penn, the Rowanberrys, Laura Milby, the preacher's wife, Kate Helen Branch, Andy's dog, Mike--nearly everyone returns with a story or two, to fill in the gaps in this long tale. Those just now joining the Membership will be charmed. Those who've attended before will be enriched. 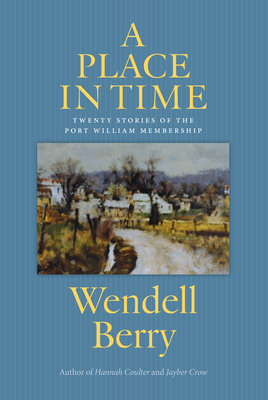 For more than fifty years, Wendell Berry has been telling us stories about Port William, a mythical town on the banks of the Kentucky River, populated over the years by a cast of unforgettable characters living in a single place over a long time. In A Place in Time, the stories dates range from 1864, when Rebecca Dawe finds herself in her own reflection at the end of the Civil War, to one from 1991 when Grover Gibbs' widow, Beulah, attends the auction as her home place is offered for sale. "And so it's all gone. A new time has come. Various ones of the old time keep faith and stop by to see me, Coulter and Wilma and a few others. But the one I wait to see is Althie. Seems like my whole life now is lived under the feeling of her hand touching me that day of the sale, and every day still. I lie awake in the night, and I can see it all in my mind, the old place, the house, all the things I took care of so long. I thought I might miss it, but I don't. The time has gone when I could do more than worry about it, and I declare it's a load off my mind. But the thoughts, still, are a kind of company."